JJuice Music values client satisfaction above all else! 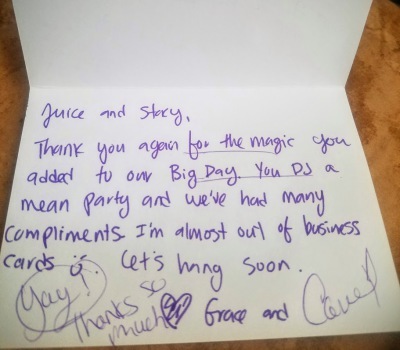 Take a look at what previous clients have had to say about their JJuice booking experience. Jamar did an A+++++ job at my sons graduation!!! Highly recommend!!!! We booked DJ & PhotoBooth services for our wedding and they ROCKED it! We have been to many weddings and Jamar and Stacy are the best by far. Jamar kept our party crowding the dance floor from 6PM-12am. Everyone wanted an extra hour at the end. He was charismatic, fun, and went out of his way to accommodate our guests. Stacy ran the best photo booth I've ever seen. Get the LED photo booth. It will take your party to the next level. Everyone loved it-kids, grandparents, etc. It was crowded all night. Stacy is incredibly organized & personable. She brings in props and awesome guest book. Besides being great at their jobs, Jamar & Stacy are people you want at a celebration. They are awesome & I hope to see them at future events. I can't recommend them enough. They are great people running the best entertainment business I have ever experienced. We had a blast at our wedding reception! Huge thanks to Jamar and Stacy for making the whole process so easy. Jamar was very accommodating to all the last minute requests and really read the crowd to keep the party going. I would recommend JJuice Music to anyone looking for an affordable DJ that delivers excellent service. Jamar was awesome! He kept the crowd going, the music flowing and was an amazing DJ-- Loved working with Juice! Jamar was professional and engaged in the event. He had a great selection of music and worked well with our program. I look forward to inviting him back for our next event. Thanks Jamar for making our wedding so amazing! Jamar and Stacy were a pleasure to work with throughout the entire process. Everyone had a blast dancing at the wedding and Jamar kept the party going! He also sang two songs prior to the ceremony which the guests loved! If you want a fun, but professional DJ, look no further than Jamar. Jamar was an amazing KJ for our party! He was easy to work with and played just the right mix of music to keep our crowd engaged and entertained. I am so happy we booked him for our event. You won't regret it! JJuice Music & Entertainment will provide a great experience for your special event. They are at karaoke nights and various bars in Minneapolis that I frequently attend. I always end up staying the entire evening when JJuice is DJing. Highly recommend! By far the best decision we made on our big day! They went above and beyond. The days leading up to the wedding were made so much easier with the ability to easily get in touch with them for any last minute details or clarifications. They also stayed beyond the original cut off time due to some transportation mishaps and continued to entertain everyone while we waited for shuttles. We had many compliments from of our guests about how wonderful it was and what a wide selection of music. They even got people out on the dance floor that we have rarely seen dance! Thank you again for the wonderful job you did. I would highly recommend them to any friends in the future! They were fabulous! They turned the rainy weather outside, which was also supposed to be a pool party, to a fun karaoke party! My chorus members also thank you since they had a blast too! We had our wedding back in July with an outdoor ceremony. Jamar killed it. Everything was set and perfect. Kept the jams coming all night. Chilled it out for the dinner part but then kicked the energy back up for the rest of the night. It was so easy to work with them and couldn't be happier with the results. Seriously the best! They take the time to make your day amazing and at the best price! Dance floor was packed all night, i highly recommend them to everyone! Could not be more happy with the service Claire provided last Saturday at my daughter's reception! She played a fantastic variety, was very professional and extremely nice as well. Would highly recommend her again to anyone. Thank you!! A huge thanks to Jamar for sharing his amazing talent at a wedding I attended this past Friday. I have not seen a dance floor stay that packed for as long as it was - it was fantastic. Professional, flawless mixing and catered to the bride and groom's music choices as well as the guests. He even sang a final song - amazing voice that should be heard by many. 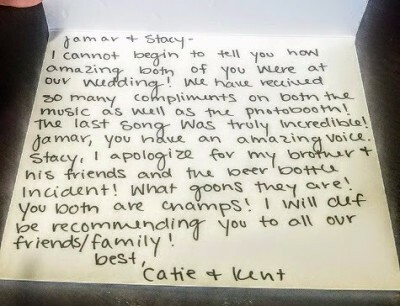 Jamar, hat's off to you and will be recommending you to anyone I know getting married. Cheers! Jamar was an excellent DJ. He played nearly every song I requested and remixed the ones that weren't super dancey to make them something everyone could dance to! He had karaoke which was a huge hit with my family! He also brought glow sticks and balloons and all of my little cousins played with them and loved them. Overall, it was awesome and we would highly recommend using this company for all your musical needs! Jamar did our wedding and it was AMAZING! It was super important to me to have a lot of dancing at our wedding, and he kept everyone on their feet up until the end. The next day, many people were commenting that it was the "best dancing at any wedding ever". Also leading up to the wedding, Jamar and Stacy were easy to coordinate. Highly recommended! JJuice performed at a decades birthday party. He was amazing and the party was a smash! I went to the Big Fat Fake Wedding event that they put on at Kieran's Pub on 4/2. It's was a fun event and the music was pumping! They had a great variety of music and played all requested tunes. I found myself up dancing and jamming out for hours (which I normally don't do by myself). I would highly recommend this professional group of folks for any event. What I thought put them in another category was that they were also taking donations for charity. JJuice Music Company does care about their community and that means a lot. We hired JJuice Music to DJ our wedding reception and could not have been happier! Jamar was wonderful to work with....so responsive and totally open to our suggestions and requests. After the wedding we received so many compliments on the music. The dance floor was packed all night! Jamar was an absolute pleasure to work with...I would highly recommend JJuice Music for any event!! Jamar (JJuice Music) was one of the best decisions we made been planning our wedding. Music was one of the top two most things when it came to what was important to us at our reception. 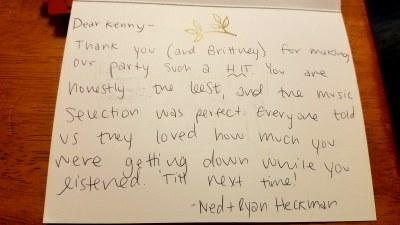 I communicated with him numerous times prior to our wedding about songs, playlists, grand entrance, etc and he was super easy going about everything I requested and went out of his way to help with what we were looking for. Now for the night of...amazing!!! He played the perfect mixture of music and worked with what the guests were loving. Everyone, young and old we're getting down on the dance floor. We received numerous compliments, including a compliment from our wedding coordinator, on how fun he was. Thank your making our wedding one of the best days of our lives!!!!!! J.Juice Music stepped in when a different entertainment vendor cancelled at the last minute for a corporate retirement party I planned for my company. I worked with the owner and lead DJ, Jamar, to have a contract signed and squared away within a few hours - super responsive. The event was a huge success with Jamar even stepping in to lend a hand when my AV vendor was struggling to get sound working. We opted for DJ service and karaoke since our retiree loves karaoke. Jamar was professional, entertaining, and intuitively understood the tone of our event and adjusted accordingly. He also helped make transitions between speeches and presentations seamless. Planning corporate events can be stressful when taking a chance on a new vendor, but I couldn't be more grateful to have worked with JJuice Music & Entertainment. I wholeheartedly recommend! They are awesome! We have used their services a few times and they do a wonderful job! Jamar and Stacy DJed our wedding and did an outstanding job. I highly recommend JJuice Music & Entertainment for any wedding or social event. We enjoyed working with them and felt we could rely strongly on them on our big day. And appreciated their ability to improvise by choosing great music and MCing through impromptu moments while keeping the dance floor energy rolling! Jamar dj'd our wedding this past weekend and did an amazing job! We received so many compliments about him and his service! At our consultation with him, he asked what kind of music we wanted at our reception and we said "club bangers", and boy did he delivered! He kept the crowd engaged and the dance floor was never empty. He even sang the last song of the night -- I was so impressed! I would recommend JJuice Music & Entertainment to anyone with an upcoming wedding. Worth.Every.Penny. We worked with Jamar and Stacy for our wedding and they did an amazing job! They were very easy to work with and helped answer all my questions. During our ceremony and reception everything went off without a hitch and I loved that I didn’t need to worry about anything. Jamar was also super receptive to some small changes I made last minute that day and made it work.